Front seat: Krissy Rootes (Evelyn) and Jake Spartz (Talmadge). Back seat: Lindsey Bushnell (Ramona). 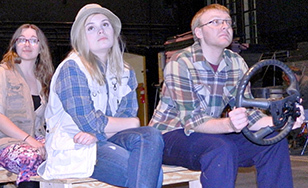 St. Scholastica Theatre will present a comedy about the complicated love lives of two women competing in a bass fishing tournament. "Zara Spook and Other Lures," written by Joan Ackermann and directed by Tammy Ostrander, premieres at 7:30 p.m. Friday, Feb. 12 at the St. Scholastica Theatre. Additional evening performances will be at 7:30 p.m. on Feb. 13, 18, 19 and 20. Sunday matinee shows will be at 2 p.m. Feb. 14 and 21. The play tells the story of Evelyn, who hopes to win the national women's bass fishing tournament sponsored by Bassin' Gal Magazine. Up against legendary champion Ramona, Evelyn may have to settle for "Rookie of the Year." Meanwhile, she must contend with her boyfriend Talmadge, who desperately wants to marry her and won't take "get lost" for an answer. Ramona, too, has a man in pursuit, her macho estranged husband who was dismissed from Ramona's life for being insensitive. Director Ostrander says the "quirky" comedy would make a perfect Valentine's date. It features performances by seniors Lindsey Bushnell, Kristina Rootes, and Jake Spartz. Rounding out the cast are Shayna Shafter, Emily Nelson, and alum Luke Moravec, who has also written original music for the show. Alumna Holly Kostrzewski is the show's choreographer. Ostrander said the show contains mature content. Tickets are $15 for adults and $10 for students and seniors. Contact the Spotlight Box Office at spotlight@css.edu or (218) 723-7000 for tickets. For more visit spotlight.css.edu, St. Scholastica's one-stop shop for arts and lectures information and tickets. St. Scholastica Theatre's next offering will be "Boy Gets Girl" in April. The drama shines a spotlight on extreme stalking. Panel discussions on stalking and sexual violence are now being planned to follow one or more of the performances.